Posted June 2, 2018 by jonmroth & filed under News. Me: Can you sum up The Adventures of a Girl Called Bicycle for the uninitiated? Christina: Bicycle is the quirky story of a twelve-year-old girl who rides her bike across the United States in search of her first true friend. It’s full of fun and surprises, plus some bits that seem clearly, fully, ridiculously fictional but are actually true, real, factual, and can be visited by kids on bikes. Me: What sparked the creation of your book? 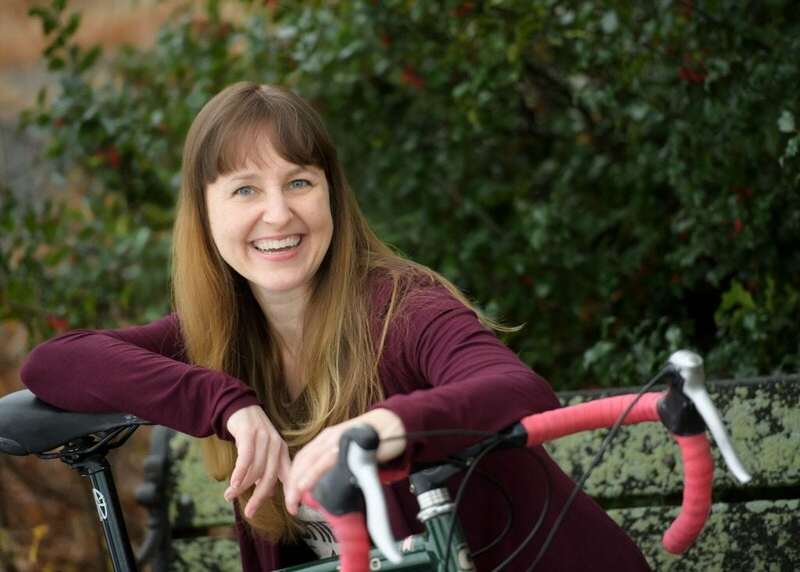 Christina: Over twenty years ago, I joined a 2-month-long 4,000-mile fundraising ride that led from Washington, D.C. to San Francisco, despite not having an abundance of physical stamina or bike handling skills. There isn’t an adjective to sum up that whole ride. It was by turns stunning, inspiring, challenging, terrifying, confusing, and electrifying, and it changed the course of my life. When I decided to write my first book, I knew it was going to involve a girl who had a crazy adventure on her bike. And I knew it would be middle-grade. The books I loved best as a kid were all middle-grade. Me: What can you share about your creative process? Christina: As a teenager, I used to hear band names in odd word conglomerations: The Inadvertent Cows or Why Me and Why You? or Here Comes the Smug. Now I hear book titles instead and immediately want to write a book to go with them. (I have eleven-year-old twins who are always saying wonderfully weird things, so I have a pretty long spreadsheet of titles I want to explore.) 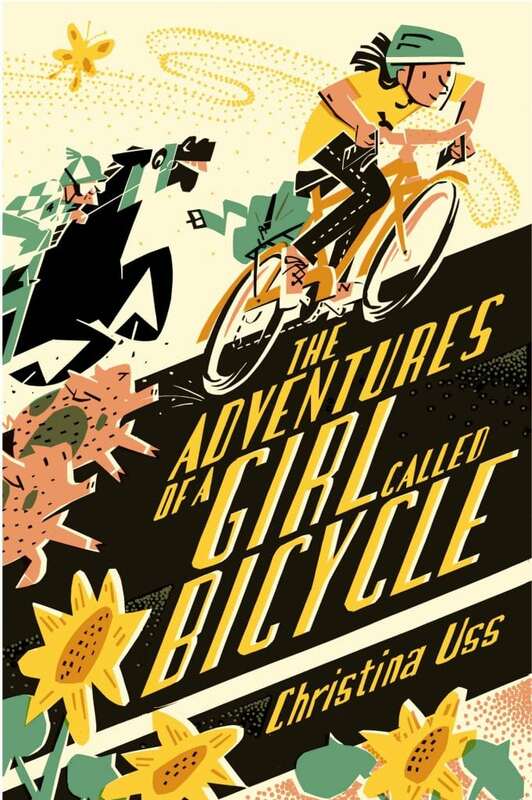 Some of the titles immediately come with a basic impression of what they’re about: for example, I knew The Adventures of a Girl Called Bicycle would involve a girl pedaling from the east to west coast, but then had to figure out who this girl was and why she was called Bicycle and what was pushing her to pedal so far. When I sit down to write, usually for several hours on weekday mornings (and once I can force myself past the anxiety that I have no talent and nothing to say to open the file and start typing), I could go for hours if no one interrupts me. It’s like going underwater and swimming around, hanging out with my characters in this alternate universe. I write pretty linearly but without an outline – just re-read what happened in the previous day’s writing and start up where that left off. Once the whole book is done, I’ll go back and see if I have a coherent plot and character arc and all that good stuff. Me: What’s the most surprising thing about your publishing journey? Christina: Everything about it is surreal! One pretty unusual thing is that my book was originally purchased by my editor, Margaret Ferguson, when she was with one publishing house, but then she chose to move to another, smaller house and asked if I’d make the move with her. My instincts said YES – she was so enthusiastic about the book, and so insightful on how to make it the best it could be – and I’m extremely glad I stuck with her and got to meet the wonderful supportive folks at Holiday House through her. Me: What do you do when you’re not writing? Christina: I love, love, love, love to sleep, read, and eat. Sometimes reading takes precedence over sleep. I’m like a literate sloth. Me: Any advice to kids who like to write? And to adults who want to write for kids? Christina: For kids: have fun with it! Give yourself permission to write anything and everything that comes into your head, because you never know when something amazing will show up. Nothing you create is ever wasted. And to adults: a wonderful task you must perform if you wish to write for kids is reading what kids are reading. In huge, delicious servings, every day. It may seem like procrastination, but Stephen King commanded us all to read voraciously, advising that we all read at least as many hours as we write if I remember correctly, and who are we to argue with him? Me: As an illustrator who works on my own covers, I’m always interested in learning an author’s involvement in and reaction to their own cover? Christina: My cover illustrator, Jonathan Bean, did an amazing job. He also made an interior map that I adore – it’s got sea monsters munching on bicycles! My editor was our go-between (my understanding is they don’t often let authors talk directly to their illustrators so they don’t hound them incessantly.) As soon as my editor told me Jonathan wanted a photo of the kind of bike my main character rode to make sure he got the handlebars and rear rack right, I knew he was a good fit. When I saw his first pencil sketch, I was floored. He’d made the cover wrap around the entire book and included so many details and characters! (In fact, my editor ended up asking him to cut back so we’d have more room for the title.) I thought for sure kids would see Jonathan’s cover and decide my book was a fun adventure in which they could lose themselves, which is all I hoped the cover would communicate. Christina: My next novel, THE COLOSSUS OF ROADS will be coming out in 2020 from Holiday House. COLOSSUS tells the story of a boy in Los Angeles who figures out how to secretly, successfully, and spectacularly fix all of L.A.’s traffic problems. And after that…maybe start working on a book titled THE INADVERTANT COWS or HERE COMES THE SMUG? Me: I’ll be looking forward to all those titles! And wishing Bicycle much success! You can learn more about Christina at christinauss.com.